I decided to use smaller needle sizes to make the jacket fit R. G. Boykin better. This was a simple and fun pattern to knit! The yarn is machine washable and dryable and cheap!!!! 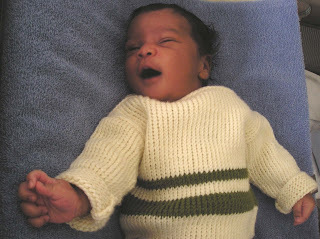 New Photos of Baby and New Knit Project. It seems like I have been working on the DROPS jacket forever, but it is coming long great. I have completed the back and am half way done with the front left. I don't know how I feel about the striping effect yet, but I do like the yarn ok.
Well, I have people to ask for more photos of the R. G. "Baby Boykin". So here are a few of him and the other boys. I hope you enjoy! Ryan at 1 week and a very tired me! And last Ryan in a little knit wear! The Boat Neck Sweater, he just had to sing about it!